On the main profile of this bottle, the area of maximum width is placed just below the centre line. The narrow-side profile follows the more usual practice for this shape of tapering towards the neck rather than towards the foot and in balancing the form by emphasising the lower area of the bottle, albeit with a broader band of maximum width. Any form of stone with natural markings has its own charms, and hair crystal is no exception. Those with a few thick hairs can be spectacular and immediately striking, while those with randomly marked thick and thin inclusions with a lot of clear space between allow for the easiest access into the game of interpretation and can also be spectacular, especially if they have some iridescence, as in Sale 1, lot 41. Those with densely included markings of similar thickness lend an overall brilliance to the material that holds its own subtle fascination. All can be equally powerful, but the levels at which the power is accessible and at its height may differ. This is an unusually bright and evenly marked example. 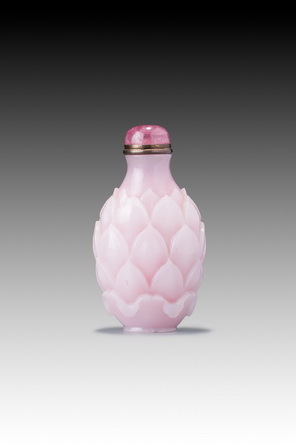 Otherwise, it represents the perfect formal integrity of so many mid-Qing crystal bottles. It is of an unusual, vertically extended form and is well hollowed while leaving a reasonable thickness of wall.